Sign the Petition - Restore Your Property Rights - 80 Feet Is Enough! 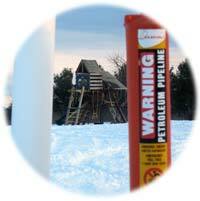 No Eminent Domain for Private Gain for Oil Pipelines — 80 Feet Is Enough! Band together with other concerned citizens and landowners across the nation by adding your name to our petition. Upon submitting the brief form below, your name and contact details will be added to a private list of signatures. The petition list will be used exclusively by 80 Feet Is Enough! to help illustrate solidarity and support when presenting our arguments to key representatives. Want to take your support a step further? After submitting the petition below, head over to the Voice Your Opinion page to directly email your local legislators a personalizable copy of the petition text below. As an American citizen who cares about property rights, property values and personal safety, I am deeply concerned about the pattern of eminent domain being used when it provides little public benefit. Related, I’m very concerned about provision #51 that was added to Wisconsin’s 2015-17 state budget through the Motion 999 process, which specifically benefited oil pipeline company Enbridge, Inc. regarding the use of eminent domain powers. The threat of eminent domain executed by the State on behalf of Enbridge’s financial gain infringes on landowners 5th Amendments rights (…"nor shall private property be taken for public use…"). Transporting oil products via pipelines through the heart of Wisconsin to be exported overseas does not constitute public use. Additionally, clearing woodlands, excavating yards, and removing buildings limits future development near the pipelines and diminishes property values. Furthermore, pipeline leaks, which happen frequently- and sometimes catastrophically- place the risk of loss of life and property squarely on the landowner. 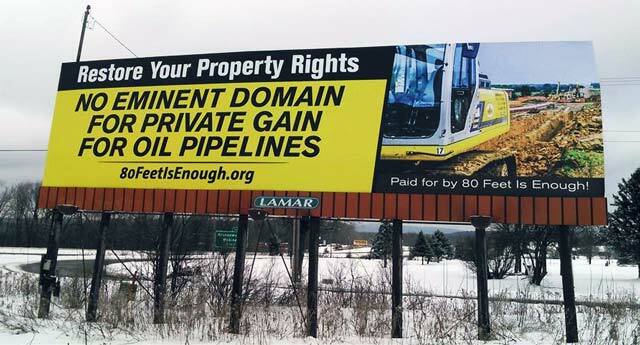 I strongly urge the Wisconsin legislature to commit to helping protect Wisconsin residents’ property rights, property values, personal safety and water quality from oil pipeline expansions by reforming Wisconsin’s existing eminent domain law. Please enter the letters from the above image to prove that you are not a bot.